This is the first time I took part in the “free copy for review” thing. Apart from that, I was reading the author’s comments on creating the book on Goodreads and eventually on his own blog. So, it was slightly different, both because I watched it being written, even if from great distance (curse me for this metaphor). Yes, I broke my own plan to only do re-reads in the rest of the year within less than two weeks. Anyway, let’s get to the review. The book starts by introducing the Magnus nobles, but the book itself starts with death count spiking right away. Not only are Numen’s relatives killed very fast, but the greedy, violent and in one case cannibalistic kings are willing to do horrible things to consolidate power in their hands. 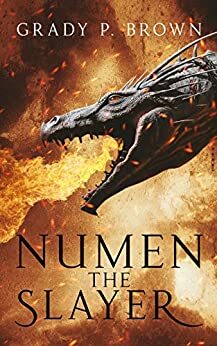 Numen is forced to run for his life with nothing but a sword that is not only family heirloom, but also dangerous piece of blood magic, giving him strength at the price of affecting his mind while under effect. Through series of circumstances, he forms unexpected allies among a savage tribe, group of freed slaves and eventually a dragon. With them at his side, he rushes against time to save his relatives, besieged by ally of the same mad king who had killed (and eaten) his closest family. That’s as much as I’ll say about the plot to avoid spoilers. Content warning: book contains blood magic, gore, cannibalism and torture. Now, the plot has potential, but the start had the mad kings/nobles kill each other quite fast and so some characters died sooner than I had a chance to understand their role (by that, I mean the power structure in Gradaia). Likewise, I thought that the some aspects of the post-battle ending were a bit too vague, but that is personal feeling. It gives all the needed information, but I somehow expected more in some aspects. Also, the narrative shifted a few times while Numen was on the run, showing plans of the kings, and in that point I was getting a bit lost in the timing, which was crucial for ‘last minute arrival’ to the large battle. The magic that binds Numen to his family sword was nice part, seeing how it changed him as the blade almost forced him to be like, ‘everyone should know I am the rightful emperor’ while he was far from effectively claiming that title while on the run. The fact the weapon had a mind of its own, and quite dark one, which kept nudging Numen to taking his vengeance, was also nice touch. If nothing else, I am all in for magical weapons with interesting powers. In conclusion, if you don’t mind cannibalistic and sadistic king, very bloody and violent deaths, cannibalism and very dark magic, it can be decent start to a series. If you are sensitive to these things, I’d say stay away for your own good. This entry was posted in Books, Fantasy and tagged book, book review, reading, review. Bookmark the permalink.